Over 100 cyclists gathered last night at Governmenet Center to participate in a very special Critical Mass ride. The group was joined by the family & friends of Rodolfo Rojo, a teen who was struck and killed by a speeding car on October 30th. Memorial t-shirts courtesy of his friends & family were given to the attendees before the start of the ride. An image of Rodolfo was on the front of the shirt with the message "Live life to the fullest", a bicycle and "Share the Road" was on the back. Shortly after 7pm the group took to the streets, we started in downtown Miami and traversed north on Biscayne Blvd to 114th street to pay tribute. 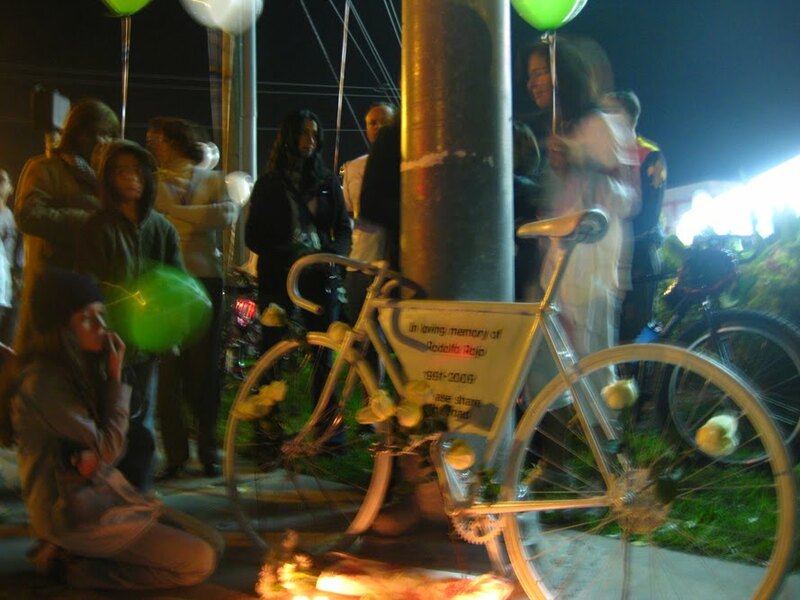 A Ghost Bike was placed just a few yards from where Rodolfo was struck and killed. Bradley Kelly, one of Rojo's best friends who was riding with him and witnessed the tragedy that night set up the memorial. At the memorial site we were awaited by more family & friends of Rojo. Cyclists converged to pay their respects and placed white roses on the ghost bike, the group then released balloons in unison celebrating the life of Rodolfo Rojo. It was a chilly and at moments somber ride last night. I believe everyone invoved was quite touched by the whole experience. Below is a video from the memorial celebration. You can read a bit more about Rodolfo Rojo and the organization he was a part of here. It's obvious he had a very bright future ahead of him. Though Rodolfo's untimely death received little to no media attention soon after the tragedy, it now appears to be finally getting the recognition it deserves. Local Spanish news station América TeVé 41 was present, their news story aired last night and can be seen below. 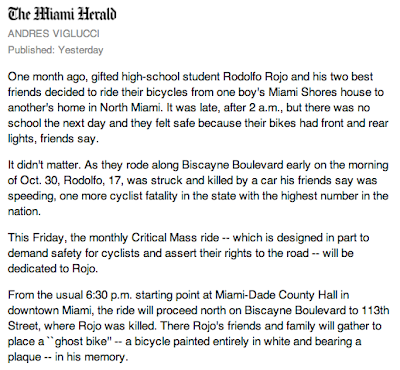 The Miami Herald ( Friday 11/27 edition) also covered Rodolfo's death & the Critical Mass ride in his honor. The piece can be read in it's entirety by clicking on the image below. I hope passerby's see the Ghost Bike and are reminded that a young man lost his life here because of someone's recklessness. Great ride and awesome weather! My prayers go out to Rodolfo's family. Next month Critical Mass lands on Christmas?! Its going to be really hard for people to go that day. Is there anyway you can reschedule it? I look forward to these rides every month. Thanks in advance! Daniel, it will not be rescheduled. It will be a xmas theme ride. Bring a santa hat. Woo hoo! A Christmas ride! Lots of good little kids hoping for new bikes under the tree to show off that night. The bike isn't there anymore! What happened to my brother's ghost bike? The ghost bike unfortunately had to be taken down by a close friend or it would have been taken down by the city and thrown away. It is now waiting and looking for a new place to stand. Rodolfo maybe gone from our sight but his family and friends who loved him and enjoyed 17 beautiful years of his life with us, will ALWAYS enjoy his spiritual presence in us. We see and feel Rodolfo's presence in everything we do kindly for each other and for others. Rodolfo's legacy is a light and a path to follow. a path of FAITH, HOPE AND LOVE. FAITH that Rodolfo is living in our hearts and that he is with us living life to the fullest, HOPE that in everything we do, we think of others too and LOVE because with it the world will always be a better place. The ghost bike is safe and it has been safe since it was taken down by Rodolfo's best friend before the city did. It will be placed at 114 in Biscayne before it is taken to Government Center for a little celebration of his life among the bike community and his friends. Those of you who still have the T-shirt from 3 years ago please wear it and join us.